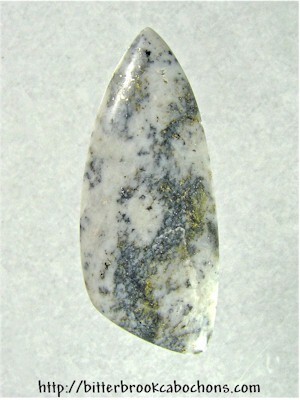 This is my first gold-in-quartz cabochon, and it's a beauty! Very difficult to catch all the gold specks in the photo; I tried "sharpening" the photo in Photoshop to make them more visible, but this is best I could do. There are lots of gold specks, and you can see them all much better in person. Wow! 46mm x 19mm x 5mm. Weight: 37.85 carats. You are visitor number 116 to this page this year.